Mr Schmidt stepped down because the search giant's business increasingly competes with Apple's. The Google CEO recused himself when Apple's board discussed the iPhone. "We commend them for recognising that sharing directors raises competitive issues, as Google and Apple increasingly compete with each other," said the FTC's Bureau of Competition director Richard Feinstein. 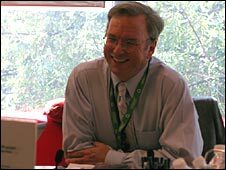 "It took Eric Schmidt far too long to realise that the two roles are incompatible; that's not surprising considering the clubby atmosphere of Silicon Valley," said the non-profit's consumer advocate John Simpson. "Nonetheless, we're glad Schmidt finally did the right thing; we call on Levinson to act responsibly and choose one company or the other." News that the FTC will continue with its inquiry has highlighted a shift in how regulators are prepared to act under a new administration said Jo-Ellen Pozner, assistant professor of organisational behaviour at Berkeley's Haas School of Business. Aside from the issue of competition, Ms Pozner noted there were some practical reasons for Mr Schmidt's much needed departure. Industry watchers said Mr Schmidt's resignation will allow Google to take the gloves off and compete more openly with Apple. The danger warned one top blog is that it could also turn the company into public enemy number one. "As computing shifts to these web based apps it's almost as if Google is taking the place as the most feared company in technology. Certainly for a lot of companies it has already taken that spot," Mr Schonfeld told the BBC. "They want to be the operating system of that world and that world doesn't care if you are using a MacBook, an iPhone, BlackBerry or Android. All this stuff happens in the cloud," said Mr Schonfeld. "It's not Goggle versus Apple. 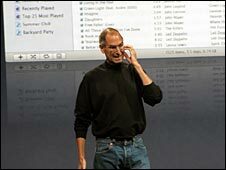 It's really Google versus the old model of computing which increasingly means Apple has more in common with Microsoft." 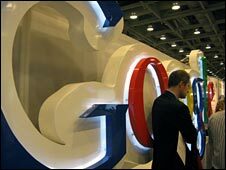 The highly respected blogger Om Malik of Gigaom.com has said that when it comes to the issue of smartphones the "battle between Google and Apple is going to get very ugly - as it should." 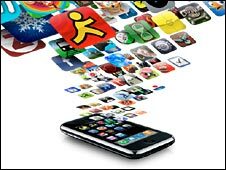 He highlighted the recent decision by the iPhone's App store to reject an application called Google Voice. That is now being investigated by the Federal Communications Commission. The timing of Mr Schmidt's resignation has also resulted in comment coming days after the FCC announced its inquiry.